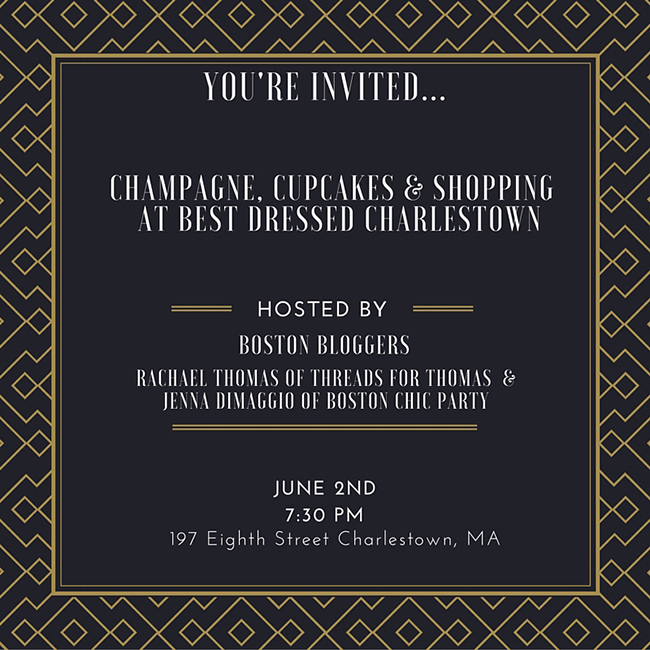 I'm beyond excited to be co-hosting a shopping event tomorrow night at Best Dressed Charlestown, with fellow blogger Jenna from Boston Chic Party, and would love for all my Boston friends/readers to come. If you have been following this blog for some time, you know Best Dressed Charlestown is my go to store for renting designer dresses for any weddings and events that I attend. You can learn more Best Dressed Charlestown here, and read why I'm such a fan of renting dresses. So if you live in the Boston area, please join Jenna and I for a night of mingling and enjoying champagne and cupcakes, all while previewing the summer collection. We would love to see you there! How fun! You go girl! This dress is perfect on you! Have a great event! Hope you have fun! Such a cute dress! Fab dress! That is amazing, Rachel! You look adorable!! Love that dress! Ahh I wish I lived in Boston so I could go!! Have so much fun! Beautiful dress! It looks perfect on you! Champagne and cupcakes-oh this sounds like too much fun! I am so bummed I can't make it tonight!! I look forward to your next event!